Are you still throwing out those empty cans from last night’s party? Wait a minute! Did you know that recycling one ‘aluminium can’ saves enough energy to run a TV for three hours? It’s the same with all the paper and packaging material you throw away. Recycling one ton of paper can save 17 trees!! The ever evolving startup space coupled with technological innovation has led to the creation of various business models and ventures that are truly unique and are harbingers of social change. This has led to the birth of web based recycling platforms that helps you to dispose recyclable waste in a responsible manner at your doorstep, while paying you the best possible price for the same. India is facing a major crisis in waste management with cities being unable to manage the large volume of waste generated. Many attempts such as centralized and decentralized composting, WTE plant etc have been carried out. But all these solutions require segregation of waste at source, which has been a big challenge in implementation. It is estimated that Delhi generates approximately 8500 metric tons of solid municipal waste out of which about 15-20% is recyclable. 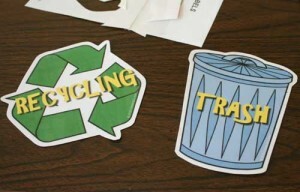 A large quantity of this recyclable material ends up reaching a landfill due to lack of segregation at source and connectivity to an end recycler. It is essential for individuals & corporates to make ‘Segregation at Source’ and recycling their dry waste a part of their daily life. Most materials that we generate in our homes and offices like papers, bottles, glass, plastic is all recyclable. A large quantity of this material ends up reaching a landfill because people don’t segregate which is a sheer wastage of resources like trees and oil. We all know that paper comes from the trees but many of us don’t know that plastics come from oil. Hence it is essential to use recycled plastics instead of virgin plastic for manufacturing of different plastic goods wherever possible. Recycling from existing waste also uses much less energy than manufacturing the product from scratch. In order to save energy it is important to recycle products and create a kind of circular/close loop economy where manufacturing of different products are getting enough recyclable waste to run their units. India’s recycling rate is estimated at about 20% as compared to Austria and Germany recycling as much a 63% and 62% percent respectively. In cities like Bangalore where the High Court has passed an order for citizens to compulsory segregate their waste into wet and dry, the actual implementation is still a challenge. There is definitely an efficient informal system running which segregates the waste. But we believe it is essential to start the segregation at a source level. If it is done at the corner dumping sites/dhallos, a lot of precious materials like bits of paper etc lose some of their value and are not accepted by recyclers. In addition, it is also unhygienic for workers in the informal system to collect and segregate such mixed waste. This is the reason that online recyclers have taken the responsibility. These start ups not just come to your doorstep to collect the recyclables but also educate you on how to segregate. The main aim behind is to solve the problem at a grass root level. The issue has always been Segregation at Source and such online portals incentivize people to do that. Recycling is really the need of the hour and such services these days offer great ease for people to be able to recycle and become environmentally conscious citizens. Indians are used to being paid for some of their waste items, which is why online companies are offering competitive buying rates. The aim main behind converting trash to cash should be to give citizens an incentive to segregate and recycle and our main aim is to collect that material which was ending up at a landfill. Online startups are giving users an easy waste to become greener individuals. Recycling is just the click of a button away. You just need to make an effort to collect and segregate.